An ex-airman who posed as a professional masseur and secretly filmed naked women using a camera hidden inside a digital clock has been jailed for three years. Matthew Yates, 38, convinced several female clients to remove their underwear for a "full body massage". He placed the clock between some of the women's legs without them knowing, Nottingham Crown Court heard. 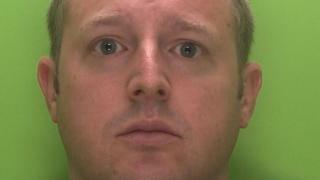 Yates, of Loughborough, was found guilty of voyeurism and sexual assault. The former RAF technician, who served in Iraq, advertised himself as a professional masseur online, despite having no experience or qualifications. Yates started as a masseur in 2012, but Recorder Paul Mann QC said by February 2015 "there was a sexual motivation" in his work. He visited the women at their homes, all in the Nottinghamshire area. Yates was arrested in November 2015 and charged with five counts of voyeurism and three of sexual assault. He denied the charges but was found guilty during a trial at Nottingham Crown Court last month. In sentencing, Mr Mann said: "Most of the women had no experience of massage. You wanted them to be naked and said that wearing pants and bra impeded your ability to give a full massage." He said Yates would use the first appointment to gain their trust and during the second appointment would massage their breasts and pubic areas, telling them it was part of a normal massage. The court heard that when victims wanted to keep their underwear on, he would move them aside during the massage. One of his victims, who was aged 20 at the time, was massaged at her friend's house. When her friend checked on her, she spotted the clock between her legs and reported Yates to the police. The woman, now 22, said: "I feel I can't trust anybody now. We can't forget about it, but now we know he is not on the streets for a while and is being punished. "From this I hope more people come forward and no-one else has to go through it." Yates, of Laburnum Way, was sentenced to three years in jail for sexual assault and 12 months for voyeurism, to run concurrently.